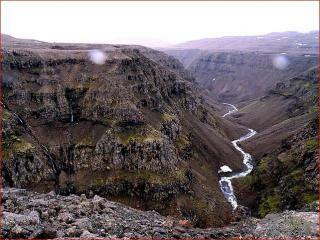 The Putorana Plateau is a remote and pristine Arctic landscape. It is situated in northern Central Siberia about 100 km north of the Arctic Circle, on a basalt and tuff plateau created by volcanism. The area holds a complete set of subarctic and arctic ecosystems like taiga, tundra and arctic desert. It is protected as the Putoransky State Nature Reserve. This mountainous area is a classical example of the so-called trappean, or stepped relief. It holds many canyons, waterfalls and lakes. Permafrost covers the major part of the plateau, where lichens and forest grow. Wildlife includes brown bear, wolf, Arctic Fox, reindeer and the endemic Putorana snowsheep. A major reindeer migration route crosses the property twice a year. The plateau is also an important stop-over point for migrating arctic birds. There is no human inhabitance in the core and buffer zones, though Dolgan and Evenk with a reindeer herding tradition live in a nearby village. way over the rocks and tundra to the edge. The view was spectacular and it was an experience I will never forget. Permafrost Mounds: See "Spatial distribution of Pingos in N Asia" ".....the Putorana Plateau (49 pingos; mean elevation 699 +/- 109masl)"
2 Community Members have visited.